(14:th-Jan-2017, 17:59:38)Astra VXD Wrote: You are not allowed to view links. Register or Login to view. I never get a regen light come on. One way to no is put your cars trip computer into instantaneous fuel consumption.on tick over it should be 0.2 if you find when u come to a round about or junction it is displaying 0.4 you no your car is trying to regen,never turn off engine if 0.4 is displaying, last time I done that the next time I started my car it went into limp mode and had zero power.keep revs 2k or over until your revs drop. My experience: when I put the foot of the throttle pedal the instant consumption should drop to 0 mpg. If not then I switch the trip computer to section ECO and under top consumers the rear defroster is listed but on the dash board ther's no light at the rear defroster button. When the rear defroster disappear from the list the DPF regeneration cycle is finished. The LED seems to be a good idea. This is how mine looks when it is doing a regen. This is how mine looks when it is finished doing a regen. Is it normal to get the "backscreen defrost" for the first 5 miles of almost every journey? I'm waiting for my happyblue to see in more detail what is it actually doing but still that's pants as I've got around 6 miles to the nearest motorway to rag it a tat. (11:th-Apr-2017, 09:35:01)Nuko-san Wrote: You are not allowed to view links. Register or Login to view. Is it normal to get the "backscreen defrost" for the first 5 miles of almost every journey? I'm waiting for my happyblue to see in more detail what is it actually doing but still that's pants as I've got around 6 miles to the nearest motorway to rag it a tat. If it comes from start it's not doing a regen, if you rev above 2k revs it will turn off. Look in the settings menu (accessible via the stereo buttons) and see if you've got the rear screen to automatically come on. (11:th-Apr-2017, 10:52:46)Big Dave2 Wrote: You are not allowed to view links. Register or Login to view. You are not allowed to view links. Register or Login to view. is right. (11:th-Apr-2017, 12:50:24)Jerry Wrote: You are not allowed to view links. Register or Login to view. You are not allowed to view links. Register or Login to view. is right. I have disable the "Auto rear demist" option and i realize that this comes on for a couple of minutes when the outside temperature is over 18-19 degrees and not below.It's a good function but i think that the operation is a bit opposite of that would be.I think that the thought of opel is to avoid the moisture of breath to the rear screen which happens when we enter to the car with low temperatures or rainy outside conditions but the whole function seems to have bugs. Has anyone tried running BOTH the mirror and the switch signal through an XOR made out of transistors & resistors to make this function a little better? 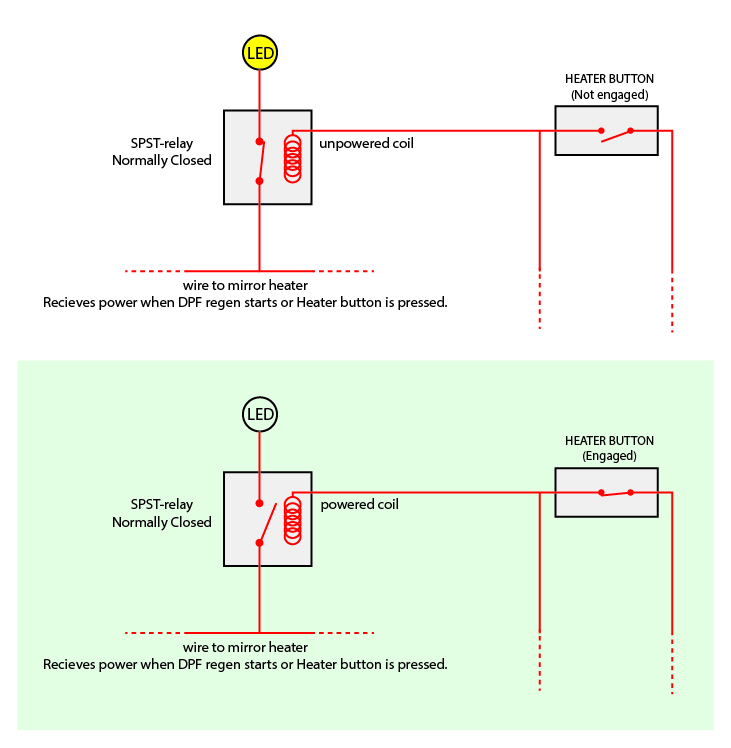 Basically, if you switch on the rear/mirror heaters manually, both the switch & the mirror lines will be live, resulting in the XOR returning false and NOT lighting the regen LED. If the regen switches on the rear/mirror heaters by itself, the XOR will return true and those lovely electrons will light up the regen LED? Ordered some 2N2222A anyway and will give this a bash, worst case scenario I've wasted a pound and some time. No I hadn't even of thought of something like that, plus it's out of my area. I would be very interested though as it sounds a great idea. If it succeeds I'll look into a how-2 + potential pre-made plug in project boxes for the lazy/out of their depth folks (appreciate doing these kind of things is not for everyone.) Premade boxes however may be difficult depending on how I can tap into the manual button push. You got me thinking about it and I think I found a flaw in the plan. You can make it work so that the DPF light won't come on if you use your heaters. But you can't make it so that the DPF light will come on when you use your heaters AND the DPF starts to regen at the same time. So that will be a setback. I'm not that great with electronics so maybe you do know a way to get it to work both ways? But I don't think you can because you can't know if the DPF is regenerating while the heaters are on because you use the same signal. If DPF regen starts when heaters are on nothing changes on the wire to the heaters. The heaters are on and stay on when DPF regen kicks in. EDIT: oh and then there's the auto demist function which wont turn on the heater button either which might give a false positive anyway. You are right, if you are already using the heater & the dpf regen starts, the xor = false would apply. It is the biggest issue of software controlled services: it's a single common wire to heat the mirrors, it's software telling it to switch on and off. Without being able to directly interface the software via a supported API for example, it's not possible to know for sure. That said, if you follow the current how to, manual de-mist + regen you wouldn't know anyway as both have the light on regardless. At least this would switch the light off when you are pushing the button, removing 50% of the false reading options you have. As to connecting, this may be where it's a do it if you dare, taking a sink off of the switch led and running it with small hookup wire. It may not be pretty. Lastly, might try to read some info with an OBD2 BT scanner and an ATMega 328p with a BT module. This is more technical & more expensive and a further iteration on improving it. Yes the issue could be all the commands are done via canbus as there is only the one wire on the heater panel which does every button. You may find you'll have to try and intercept them signals & see what is going on. Sure You are not allowed to view links. Register or Login to view. could explain that. That's my thoughts You are not allowed to view links. Register or Login to view. Ok, I went down a rabbit hole. I now have a canbus shield ordered and will be making a logger. Pretty sure from what I have found out it will be running on MS-CAN. Once I isolate the logs for the data needed, should be able to make a plug and play box that simply connects to the centre console as a plug-through system. The final product can run off a simplified MCP2515 and atmega 328, keeping costs lower. I dunno if it can be found on the mid speed, I planned to sniff on the hs but I got quite the backlog of stuff I want to do. The gmlan bible doesn't have a CAN id for it either so no joy there. What resource hinted that you would be able to find anything on the MS lan? Also, how do you plan on toggling DPF regeneration while logging? Little bit more thought after a few tins of monster and yes, if I want to try catching the regen I will probably find that on the HS, however I suspect it is communicating with the LS and/or the MS through the CIM/radio unit. I actually ordered a triple pack, might data log them all and the plan is to simply drive around with the standard regen LED mod, capture the time and disconnect the loggers once it goes off. That's not a bad plan but it'll be pretty tedious. If you haven't looked at either bus so far, it might be a bit overwhelming. There's a ton of messages being passed around. Don't expect to find what you're looking for without some rigorous filtering set up. On the HS bus the traffic volume is too high to simply log over serial. Longer periods of logging would require an sd card. I'll see if I can force a DPF regen over MDI. If so, it'll be much easier to track precisely which messages are relevant. Apparently the happyblue module can show this, so we can also look at the firmware on this device but my guess is this'll be even more tedious. I placed the led on the removable top cover found this easier. I was just talking about the regen yesterday: typical to cover over 1000 miles on the motorway across a couple of days, to then get a regen during a short journey! Life has been quite upside down for me recently, need to get back on the one-wire data logging and start analysing it. Current time: 25:th-Apr-2019, 07:27:34 Powered By MyBB, © 2002-2019 MyBB Group.